American physician mission specialist astronaut 1996-2003. Perished in Columbia shuttle disintegration during re-entry. Status: Deceased; Active 1996-2003. Born: 1956-04-16. Died: 2003-02-01. Spaceflights: 1 . Total time in space: 15.93 days. Birth Place: Arlington, Virginia. Educated William and Mary; Eastern Virginia Medical. Born April 16, 1956 in Arlington, Virginia. Single. Enjoys flying and bicycle touring. Was a four year collegiate varsity gymnast. While in college he performed in the Circus Kingdom as an acrobat, 7 foot unicyclist and stilt walker. His parents, Paul and Dorothy Brown, reside in Washington, Virginia. Graduated from Yorktown High School, Arlington, Virginia, in 1974; received bachelor of science degree in biology from the College of William and Mary in 1978 and a doctorate in medicine from Eastern Virginia Medical School in 1982. President, International Association of Military Flight Surgeon Pilots. Associate Fellow, Aerospace Medical Association. Society of U.S. Naval Flight Surgeons. Navy Operational Flight Surgeon of the Year in 1986, Meritorious Service Medal, Navy Achievement Medal. Brown has logged over 1,700 flight hours with 1,100 in high performance military aircraft. Selected by NASA in April 1996, Brown reported to the Johnson Space Center in August 1996 to begin two years of training and evaluation. Successful completion of initial training will qualify him for various technical assignments leading to selection as a mission specialist on a Space Shuttle flight crew. Family: Astronaut. Country: USA. Flights: STS-107. Projects: STS. Agency: USN. Bibliography: 12, 5211. 1956 April 16 - . Birth of David McDowell Brown - . Nation: USA. Related Persons: Brown, David. 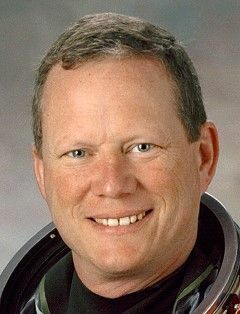 American physician mission specialist astronaut 1996-2003. Perished in Columbia shuttle disintegration during re-entry. 1 spaceflight, 15.9 days in space. Flew to orbit on STS-107 (2003)..
Death of David McDowell Brown. - . Related Persons: Brown, David. American physician mission specialist astronaut 1996-2003. Perished in Columbia shuttle disintegration during re-entry. 1 spaceflight, 15.9 days in space. Flew to orbit on STS-107 (2003)..